County Commissioner Mike McCarty shows his ID and becomes the second Clinton Countian to cast a ballot in the May primary. 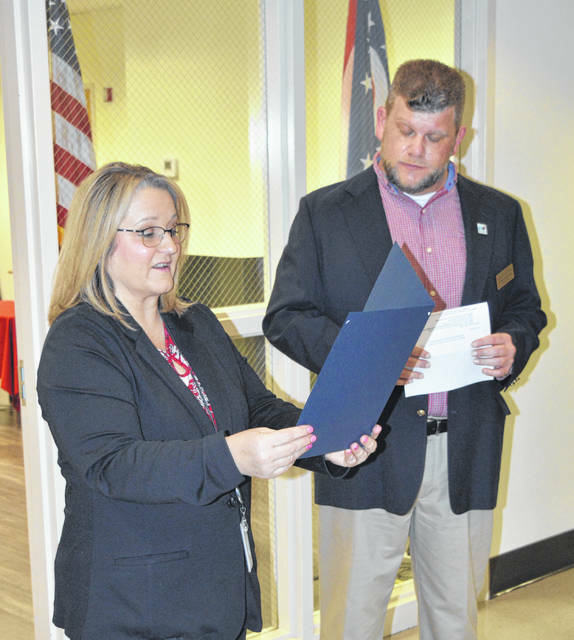 Lori Baldridge, representing the Ohio Secretary of State’s Office, with Clinton County Board of Elections Director Shane Breckel. 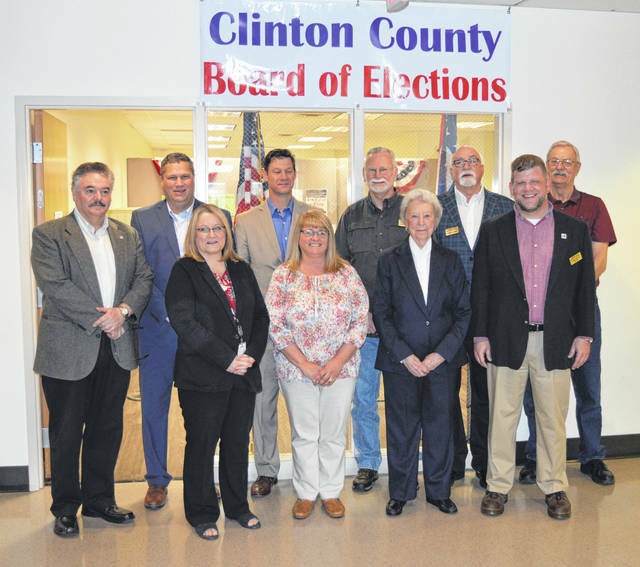 From left are Clinton County Republican Party Chairman Tim Inwood; County Commissioner Mike McCarty; Lori Baldridge, Liaison of the Ohio Secretary of State’s Office; County Commissioners Kerry Steed and Brenda Woods; Board of Elections Board Chairperson Steve Fricke; voter Lois Allen; Board of Elections Board Member Jim Gibson; Board of Elections Director Shane Breckel; and Board of Elections Board Member Joe Daugherty. Former Clinton County Board of Elections board member Lois Allen, left, had the honor of being the first local citizen to vote in the May 7 primary election. 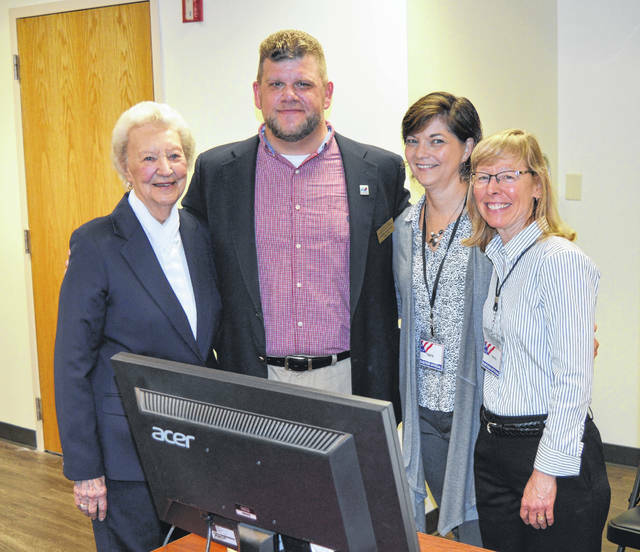 She is shown with Board of Elections Director Shane Breckel and Board of Elections staff members Tanya Snarr and Mindy Henson. 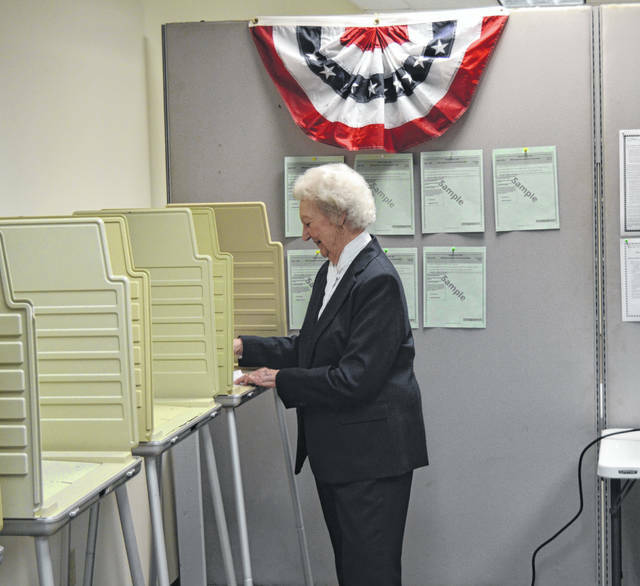 Lois Allen casts the first votes in the May primary election at the new Board of Elections office on South Nelson Avenue in Wilmington. 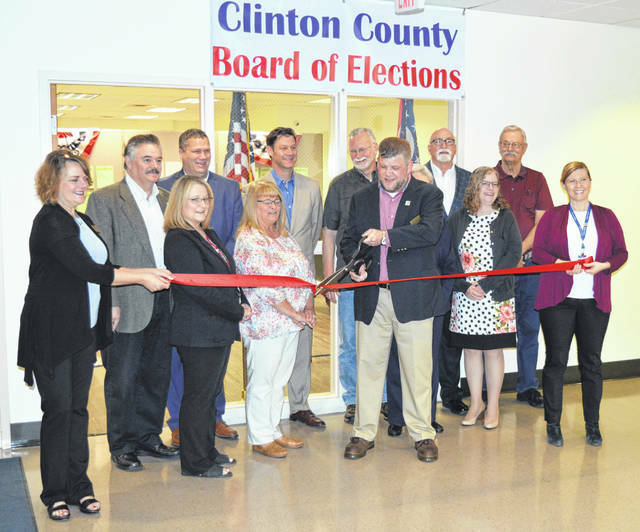 The Clinton County Board of Elections — now located at 111 S. Nelson Ave. Suite #4 in Wilmington next to the Health Department — hosted a ribbon-cutting early Tuesday morning along with the Wilmington-Clinton County Chamber of Commerce. The event was held to spread the word about the new location as well as to herald the start of in-person early voting for the May 7 primary election, and to display new technology in place at the Board of Elections. Attendees included board of elections members and county and other local officials. For more photos, visit wnewsj.com.